2008 New Crop Coffees – Come and Get Em! 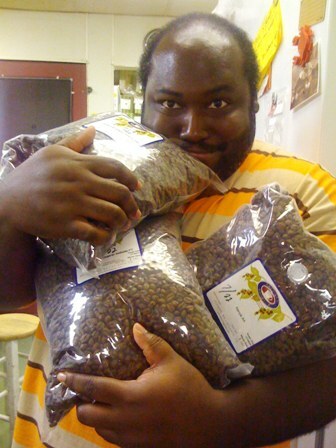 This is a picture of Tone breaking Commandment 10a – Dude, you can’t covet our new crop coffees! Over the last few weeks we’ve been receiving coffee shipments from Batdorf and Bronson highlighting the 2008 new crop coffees from the Americas, Africa and Indonesia. We have been brewing most of these coffees over the last couple of weeks, but we have also switched our brewing method too, so we haven’t announced the coffees until we had all the bugs worked out from our end. We are now brewing our coffees using a French Press then pouring the freshly brewed coffee into one of our airpots. The coffees are damn amazing! The French Press method allows all the nuances and distinguishing cup characteristics of the coffees to shine and shine brightly. We still have some tweaking to do and we are still waiting for new equipment. The operational logistics and brewing ratios have been a little exciting. But, I had the chance to experiment a lot with the coffee to water ratios while on vacation and had the time to think about the process – so we are almost there. Here are the coffees we are now featuring -BTW, awesome job on sourcing these coffees, Batdorf and Bronson. Organic Costa Rica Cerro del Fuego: great balance, complex, citric acidity, syrupy body and flavors of tropical fruits and nuts. Organic Mexico La Trinidad: great acidity, sweet, candy bar milk chocolate flavors. Costa Rica La Minita: this coffee rocks my perspective on the world and makes me want to get up every morning! It’s intense with brillant flavors of sweet maple syrup and fresh orange. Guatemala El Valle: This coffee is smoky and spicy right now but as it matures great flavors of rum and caramel appear. Kenya AA Ruiru Tassia Estate – Top Auction Lot: Deep fruit tones of current and blueberries with a vibrant wine-like acidity. Sumatra Lake Tawar: Bold and complex, full-bodied with flavors of tabacco, butterscotch with an acidity of bell peppers and herbs that lend to flavors of cedar and sage. Ethiopia Harar: I am drinking this coffee almost daily right now and in the past this coffee hasn’t been on my taste buds radar but now I love it. The Harar is especially yummy in a French Press. I find the French Press really enhances the wildness of the coffee, especially since most of the Harar is still grown wild in the forests and roadsides of Ethiopia. This coffee is full-bodied with a fruity aroma and rich blueberry flavor. Covet our new crop coffees – either by the cup or whole bean – it’s ok, we checked! Do you guys still do cuppings?